In Nicaragua, BSF collaborates with the local non-profit, Nicarali, to implement projects that reinforce the development of libraries in rural areas. In Nicaragua, BSF collaborates with the local non-profit, Nicarali, to implement projects that reinforce the development of libraries in rural areas.Due to poor internet access in this region, the availability of educational resources was recognized as a particularly important element to improve. Nicarali identified an absence of educational resources and poor internet access as important obstacles in terms of providing the people of Nicaragua with access to information and education. This was all made possible thanks to the success of a crowdfunding campaign through the Goodeed giving platform. In 6 days, 3615 different donors viewed ads and awareness raising videos that generated an amount of revenue, thus allowing this project to happen. creating content, saving and transmitting the heritage of indigenous cultures for community members. Libraries Without Borders proceeded to a wide selection of online contents in line with the objectives of the projects. 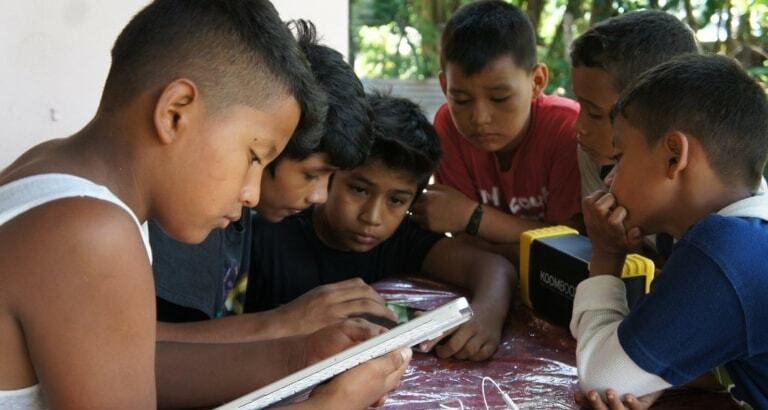 Furthermore, BSF provided two Koombook kits to Nicarali and trained volunteers from the nonprofit to assist local communities in taking advantage of these resources. Originally based in Chaguitillo, the Nacarali team trained professors in 12 communities and provided training and outreach activities to students and their parents. The volunteers worked in close connection with the mobile library (creating activities, adapting content, etc. ), to guarantee independent use of the Koombook following their departure. A similar project was implemented in the summer of 2017 at Laguna de Perlas, located on the Caribbean coast.